It was a warm and sunny day at Orphans of the Storm®, so for the most part the dogs I met were happy to find a shady spot and relax! 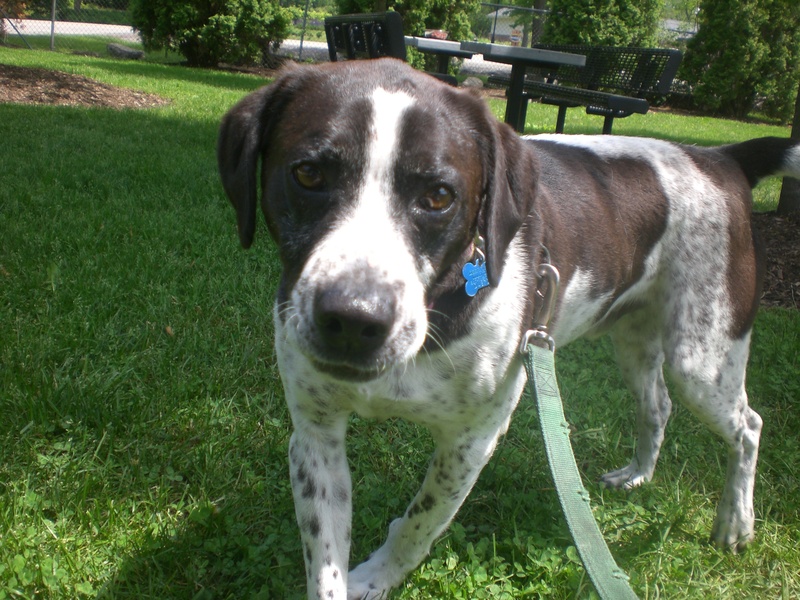 Tucker the two-year-old Hound mix is a real cutie (much like the other Tucker, but with black spots instead of brown). He caught my eye as soon as I walked into the wing with his kennel and I knew I wanted to get to know him because he greeted me in such a friendly way! 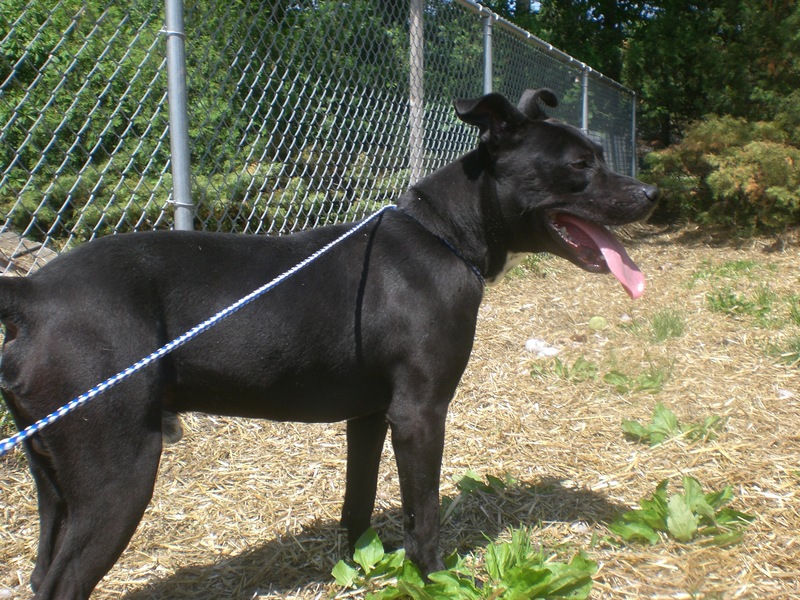 Tucker continued to be a happy, friendly guy as we took our walk around the shelter–and walking him was a pleasure because he walked so nicely on the leash! Tucker was very interested in the other dogs we saw while we were out and about, though we didn’t get close enough for any actual playtime. When it was just me and him, though, he was very attentive and enjoyed getting a good scratch on the back. Tucker is still on the younger side, so he would certainly like a family that will play with him and take him for nice romps outside. 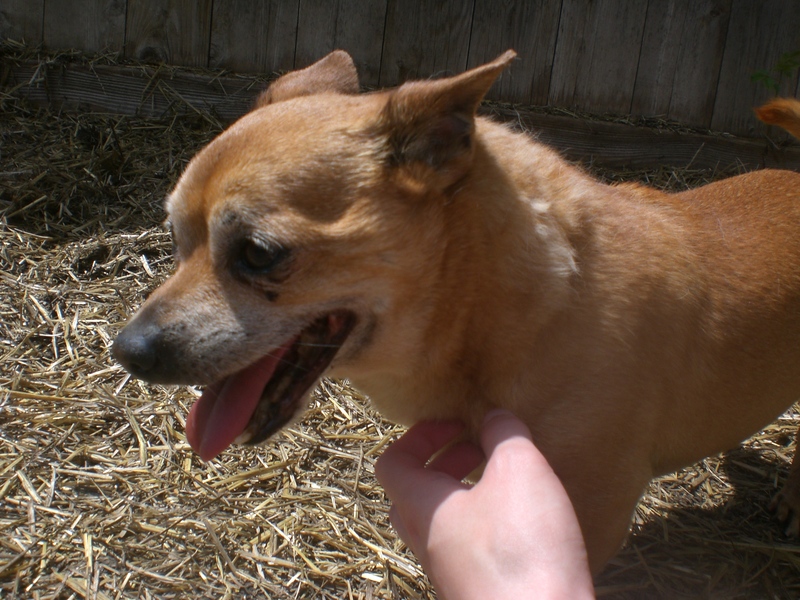 A cutie like Tucker won’t be at the shelter for long, so come in soon to meet him! 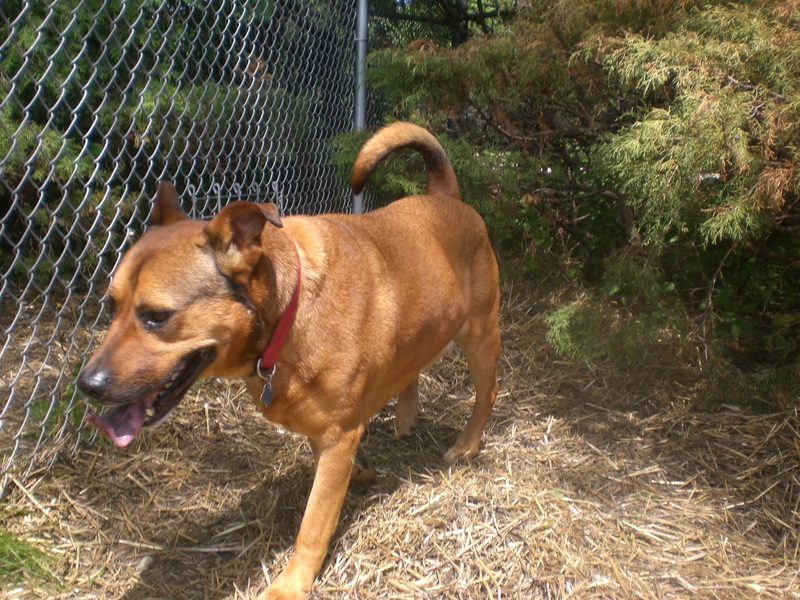 Bueller the five-year-old German Shepherd mix has a bit of an independent streak. He was more than happy to lead the way on our walk to the off-leash run, and once we got there he was more interested in exploring all of the interesting smells and seeing what it was like under the bushes (cooler, I’m sure). Bueller was sharing his kennel with another dog for a short time before the other dog got adopted, so he may be able to go to a home with or without another dog. “Bueller? Bueller?” Unlike the movie character, he’ll come when called! Bueller just loves going for walks, though. After we were in the off-leash run for a bit, he saw me pick up the leash and came running right over with his tail wagging. (Some dogs run in the opposite direction when they see me get the leash.) Bueller waited patiently at the gate while I put the leash back on and gave me a big doggy smile. He just has such a sweet face! 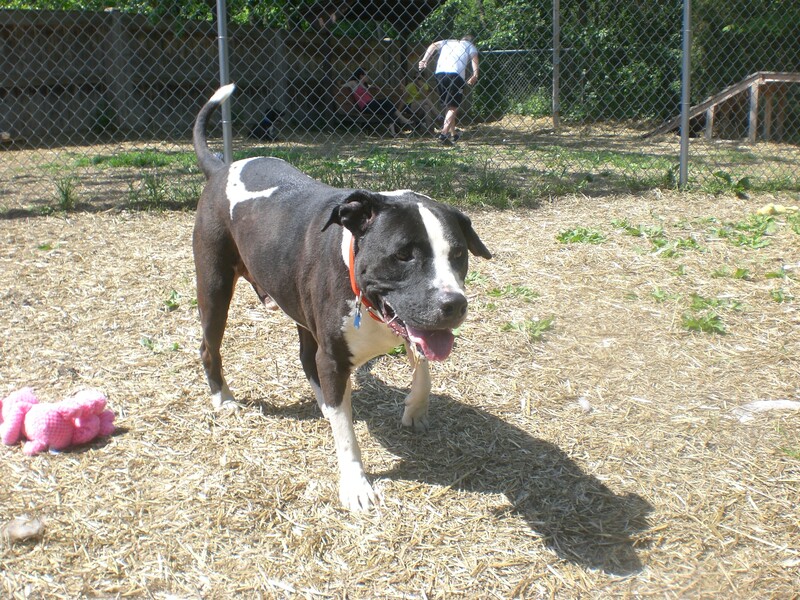 Bueller is a big boy with a big heart who would love to join a happy home. Come in soon and say hi to Bueller! 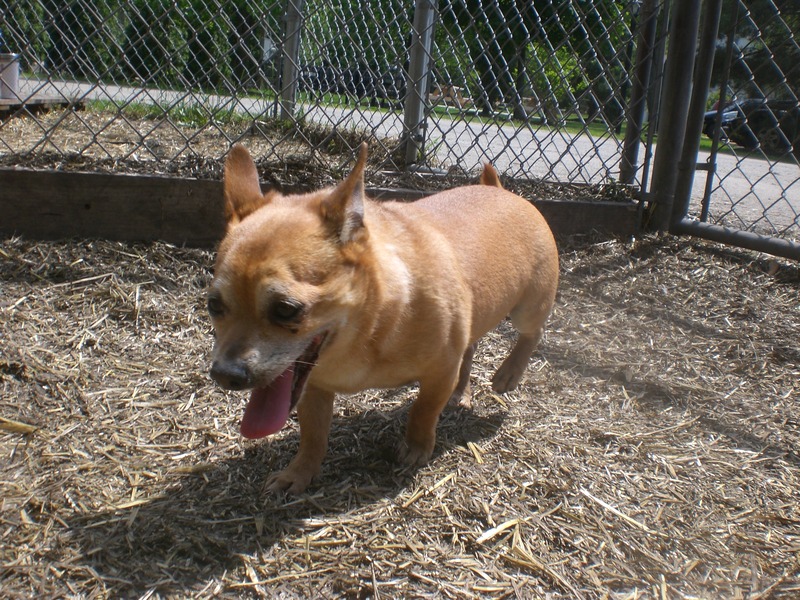 Rocky the eight-year-old Chihuahua mix found himself at the shelter when his family moved and couldn’t bring him with. He’s a little nervous when strangers come up to his kennel, but when he saw I had a leash with me he calmed down immediately and let me put the leash on with no problem. Rocky is currently sharing his kennel with Gypsy, so he could go to a home with or without another dog (though he would probably be more comfortable with a dog closer to his size). Rocky is a little snuggle-bug. After we got to know each other a bit in the off-leash run, I picked him up and put him in my lap, where he happily sat while I pet him. (Gypsy tried to jump into my lap to steal some attention for herself, too.) Rocky has the cutest underbite, so his bottom teeth stick out a bit when he has his mouth closed. 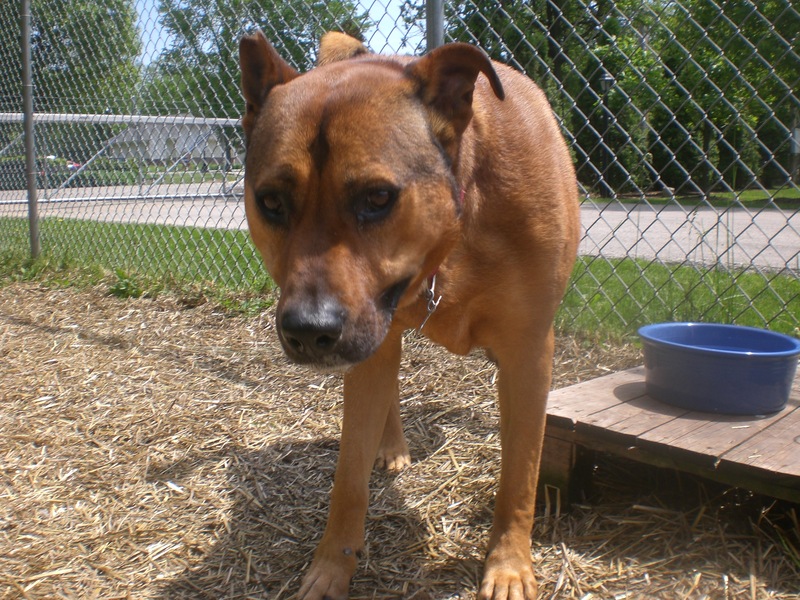 Rocky has eight years of experience as a family pet, and has plenty more years of love and companionship to offer! 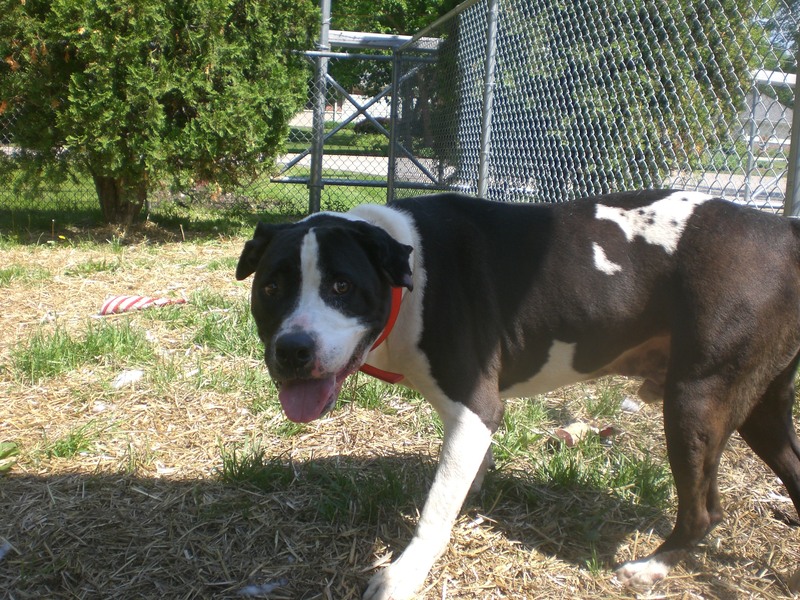 If you’re looking for a new pal, stop by the shelter soon to meet Rocky! 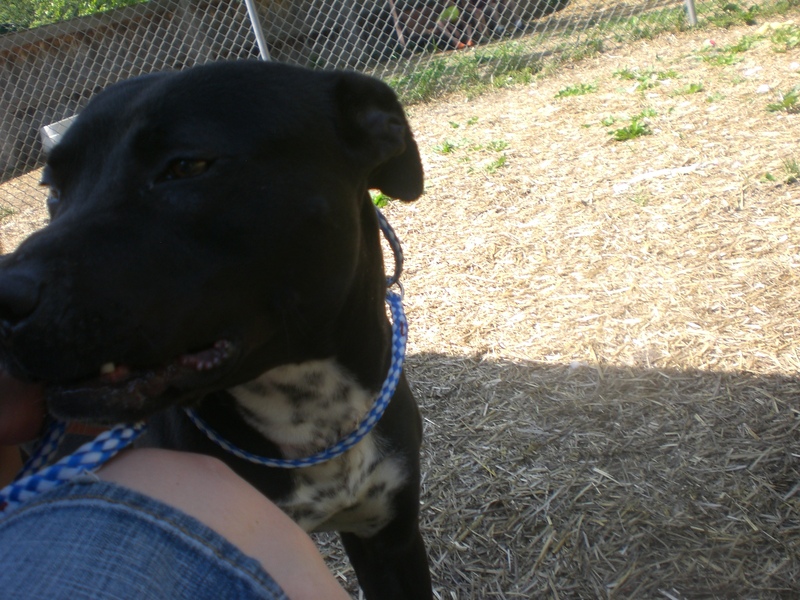 Stanley the one-year-old Pit Bull Terrier mix is still very much a puppy, one who could use lots of love and attention. I’ve been trying to take Stanley out for weeks, but he would always go hide in the indoor part of his kennel. I’m glad I was finally able to get to know him, because he did not disappoint. Although he can be a little difficult to get out of his kennel (Stanley seems like he has minimal to no experience with a leash), once he’s out he turns into the biggest sweetie. Stanley and I headed straight for the off-leash run, where he wanted to explore inside the bushes and find some shade. Instead, I took him over to the shady bench and he sat right next to me, resting his chin in my lap and enjoying getting my undivided attention. When we left the run, he found another shady spot in the grass and laid right by my feet so I could rub his belly. Stanley probably hasn’t had very many positive experiences in his short life thus far, but once he sees that someone is nice to him, he becomes a fast and lasting friend. Could Stanley be that friend for you? Come by soon to find out! Scotty the eight-year-old Pit Bull Terrier mix is much like little Rocky, in that they’re the same age and they both came from owners who could no longer take care of them. Scotty certainly seems like he knows just how to be a good pet: he’s housebroken, he walks nicely on the leash, he’s calm, and he enjoys being around people. Scotty spent a few minutes just meandering around the off-leash run, but eventually came to me on his own and enjoyed getting a good scratch on the back. You’ll have to be okay with a little bit of doggy drool if you adopt Scotty, but he’s definitely worth it! This big boy doesn’t understand why he lost his first family, but he’s more than ready to enjoy the rest of his life with a new one. If you’re looking for an older, gentler dog who already knows what it takes to be a good pet, stop by the shelter and see if Scotty is the one for you! I also saw my girls Molly (who was a very good girl while getting a quick bath in the yard), Diamond, Lady, and Shasta, and my bestest boy Archie, who I just cannot say enough good things about. 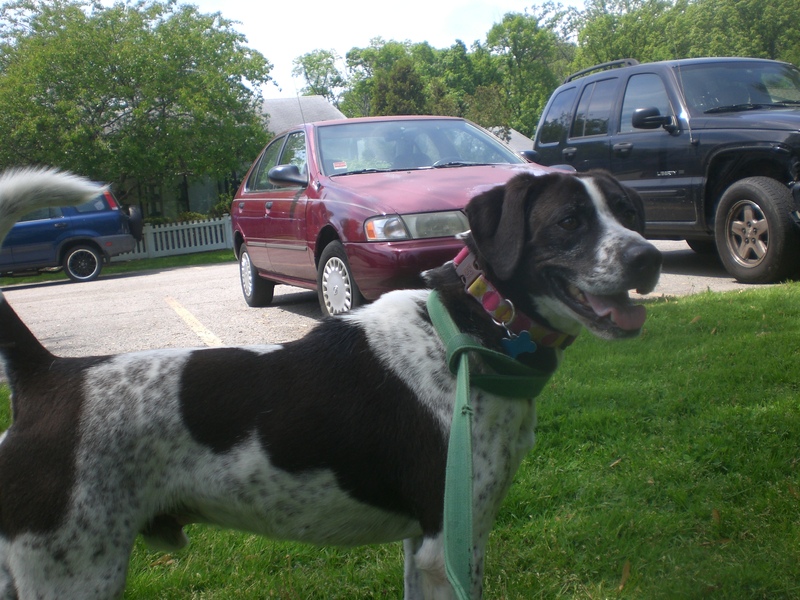 Posted by Meet the Pooches on June 5, 2014 in Dog Profiles and tagged adopt, animal shelter, animals, Chicago, Chihuahua, dogs, Hound, Orphans of the Storm, pets, Pit Bull Terrier, Shepherd.